Tracy Eastman was born and raised in San Anselmo, California. She studied Visual and Performing Arts throughout her education at Drake High School in San Anselmo and later at the College of Marin (COM) in Kentfield, California. Realizing her interest and talent in the precise rendering of human faces, she soon focused her college career on Visual Fine Arts. She studied traditional techniques of Fine Art under choice mentors and professors at COM who introduced her to new media such as oil paint, acrylic paint, fresco, encaustic, gouache, egg tempera, clay-sculpting, and stone-carving. Soon into her deep exploration, Eastman developed a rich passion for art and a desire to share her new knowledge with others. She assisted a number of teachers at COM in mixed media Fine Art and Art History courses, performing short lectures and demonstrations to students. She later went on to work for Youth in Arts in San Rafael as a Mentor/Teaching Artist for in-school and after-school programs, working with students from kindergarten through high school. She continued to create her own artwork which often reflected her personal experiences or memories, as well as fulfilled commissions for clients, such as large murals and portraits of pets and people. Eastman’s paintings, drawings, and sculptures have been in many shows and competitions and have won a number of awards. 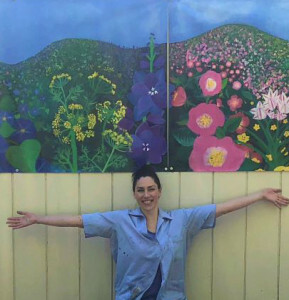 For over thirteen years, she has regularly participated in the Italian Street Painting Festival in San Rafael/Marin County and other counties across the Bay Area. She currently works as an independent Muralist, Portrait Artist, and Teaching Artist and continues to graciously share her passion and artwork with the community.